To anyone that actually enjoys reading these, or at least seeing the graphics, I apologize for not posting more frequently – I’ll try to at least post the graphics to Twitter more frequently. I keep telling myself I’m not posting because the Caps are good, and everyone knows they’re good, so there’s no real reason to dig into the data. 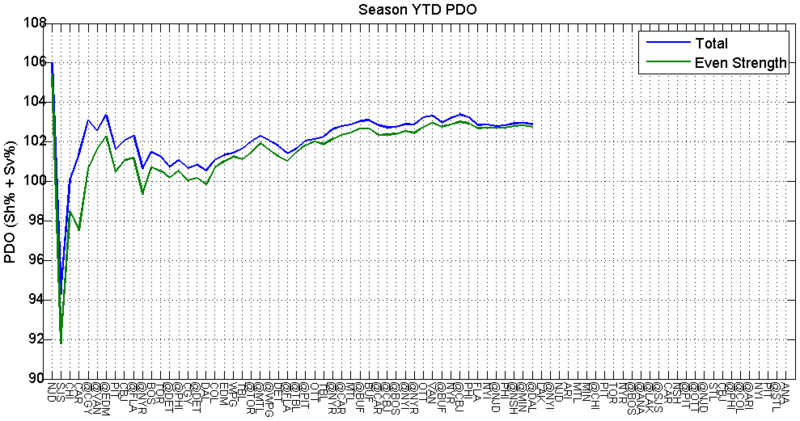 But I guess there’s always a reason to look into the data, and really I’m just lazy. Are the Washington Capitals world beaters? Or have they merely been a combination of fortunate and opportunistic? Yeah, this is getting out hand now. I’d photoshop a Price is Right Cliffhanger onto this if I had the ability. 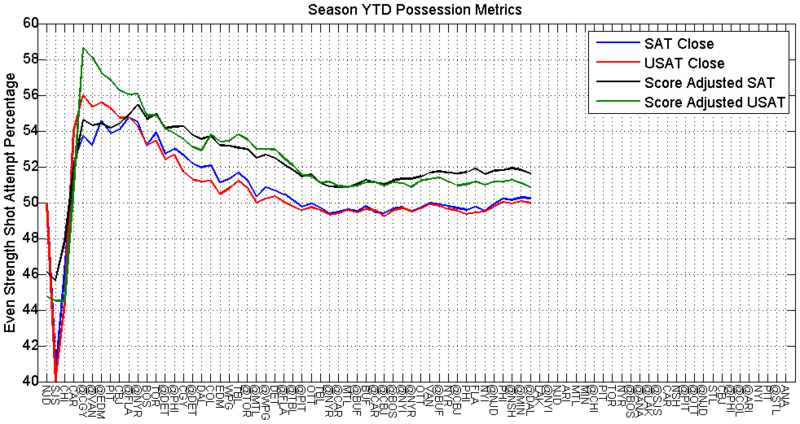 The possession trends are ok. Obviously the Minny and Dallas games are concerning. The Dallas game especially. Even though the third period felt like it was dominated by the Caps, they only controlled 50% of the shots. The second and first periods were abysmal. 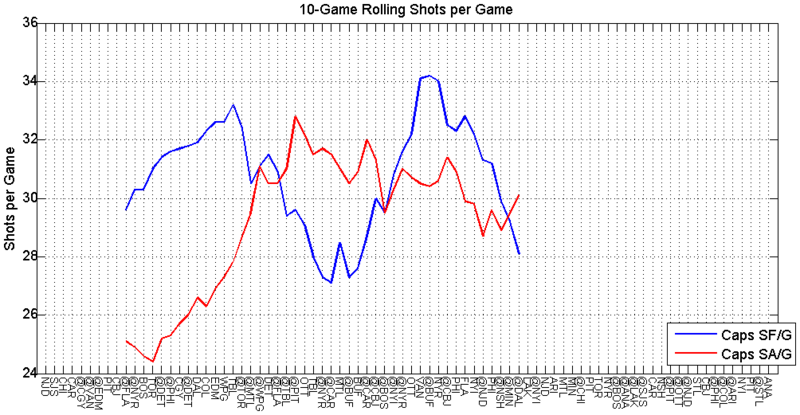 The Minnesota game is a game skewed by the Caps turtling in the third, where they directed less than 30% of the shots. But before those games, the only game to be spoken of negatively was the Isles game and even that game had a silver lining that the shots were inflated by a lot of blocked shots by the Caps. 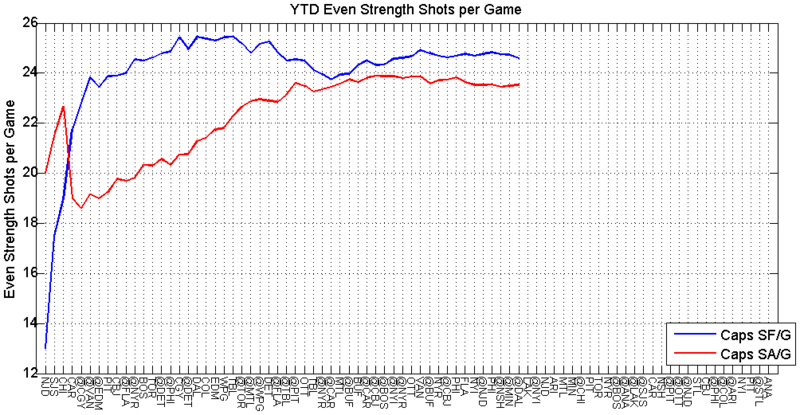 The unblocked shots and on target numbers are much more digestible. There’s a lot of context missing from the shots on target data. I’d like to see the shots against come down more, because if they continue on their path they’ll likely eclipse the 30 mark. And that triggers my Oates PTSD. 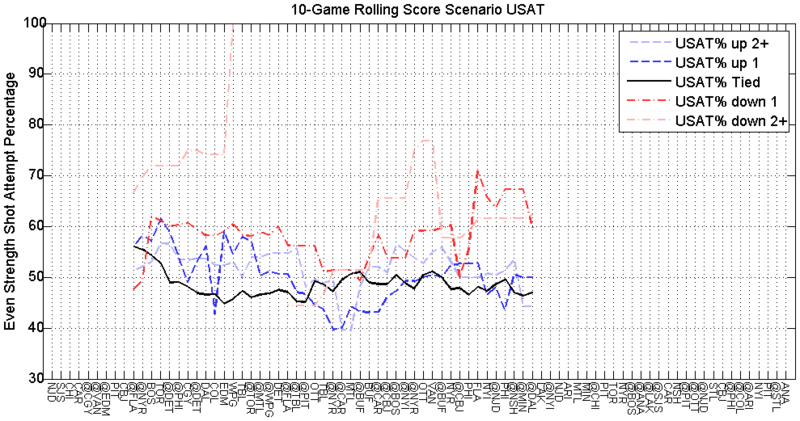 However, if the Caps are continuing to hold a lead through a lot of their games, and obviously late into the game (bespoke by their record), expect them to have to do a lot of weathering the storm. Maybe the Caps are a 102+ “true talent” PDO team? (Please oh please?) 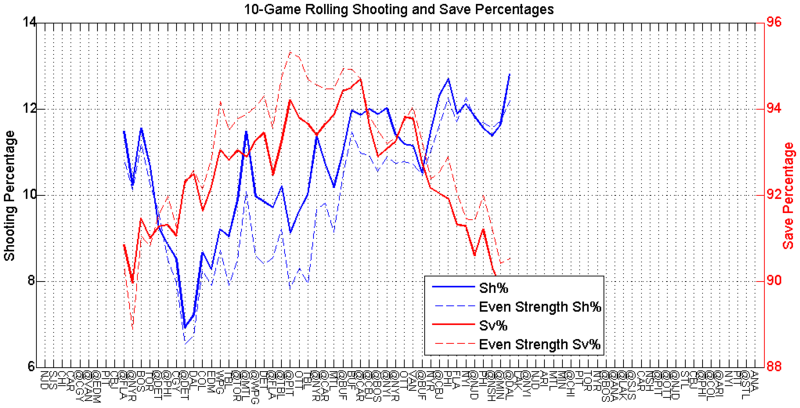 I’m still very skeptical of the ability for them to shoot above 12% at even strength. 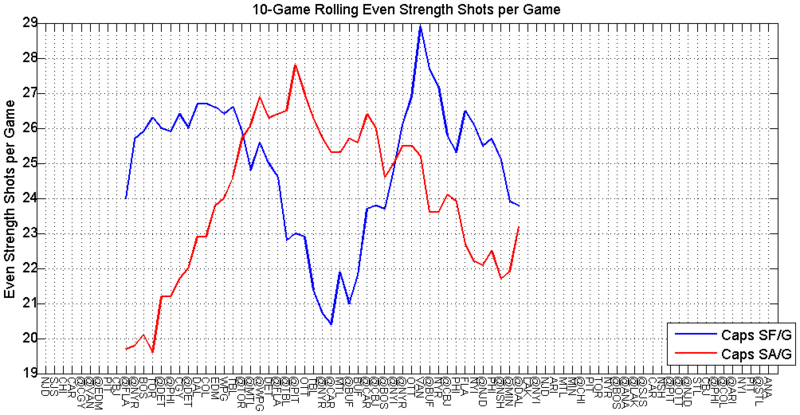 If anyone is willing to take a bet that says the Caps won’t continue to post 10 game rolling even strength shooting percentage in excess of 12%, I’d take that bet. But I would have taken that bet at 10%, and like 20 games ago, and I’d have lost my money. I’m hoping Holtby starts to get back into form (he’s been looking eerily mortal lately), or the Caps stop leaving him out to dry so much, because they are really due for some offensive regression. Obscene. 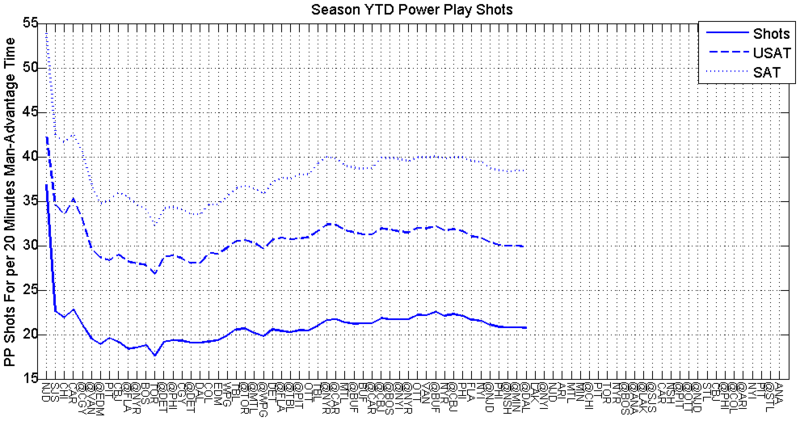 In 8 games, the Caps have stripped their power play shot generation in half. 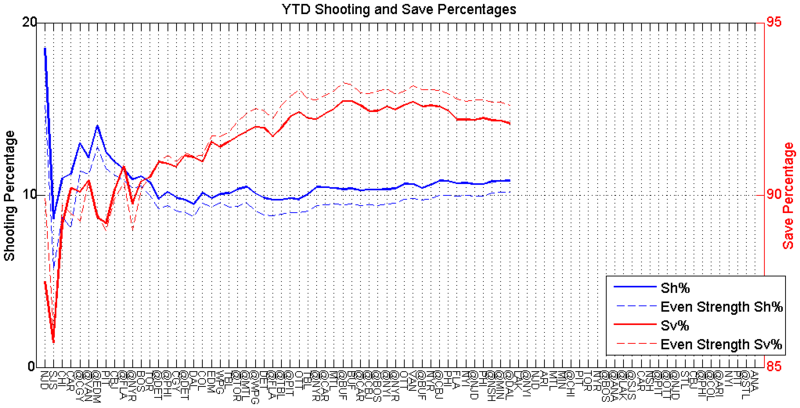 From 26 shots on target per 20 mintues, to 13 per 20. 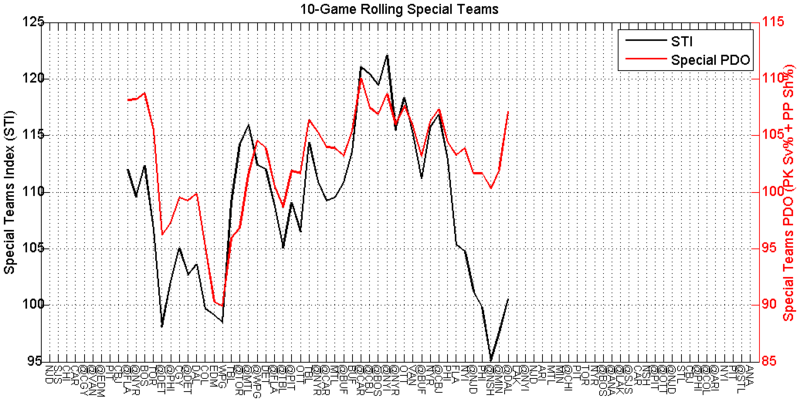 Obviously in some of those games the Caps were without Ovi and MJ90 – two key components to the unit. 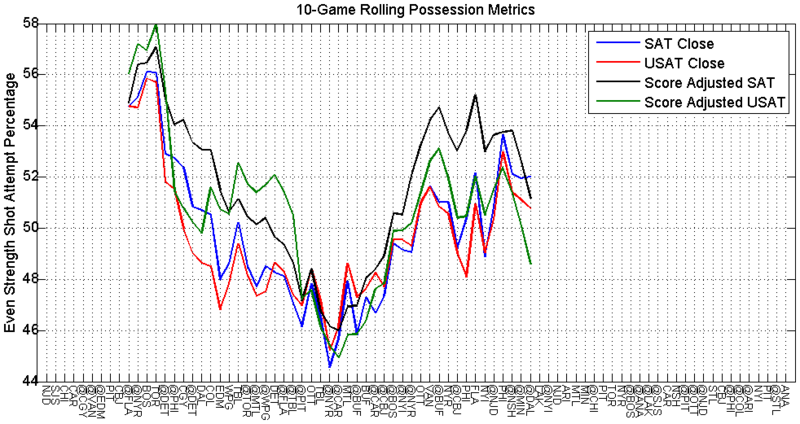 But even with both of them back, things have not rebounded. Something is amiss. Almost like once Carlson came back 7 games ago? 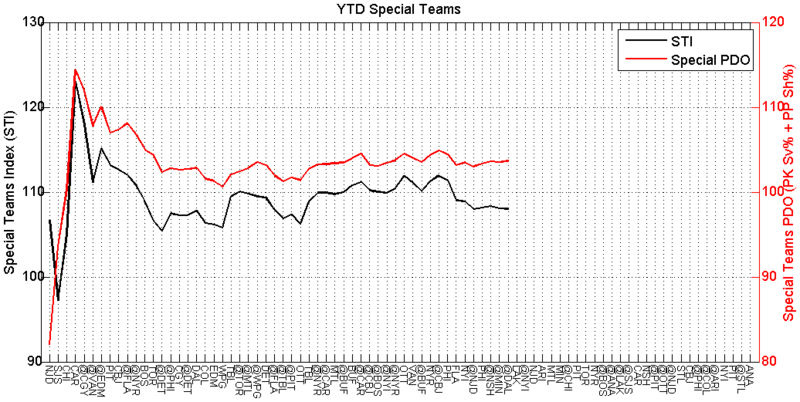 Whatever it is, it’s obviously a big contributor to the special teams misery. 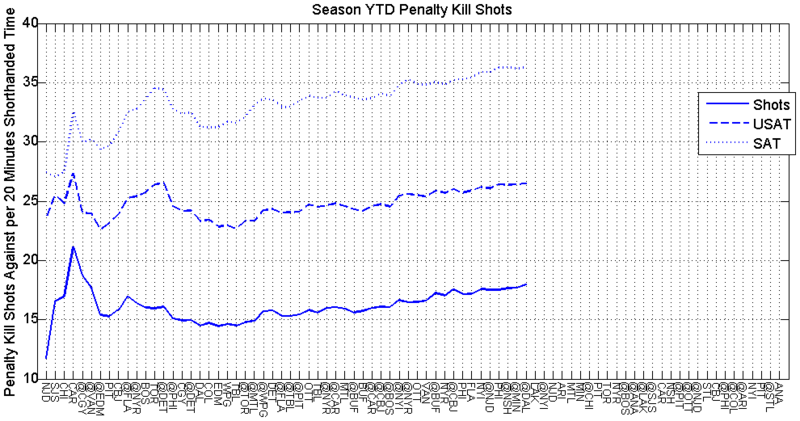 The penalty kill efficiency is diverging from the save percentage a bit in the YTD data. 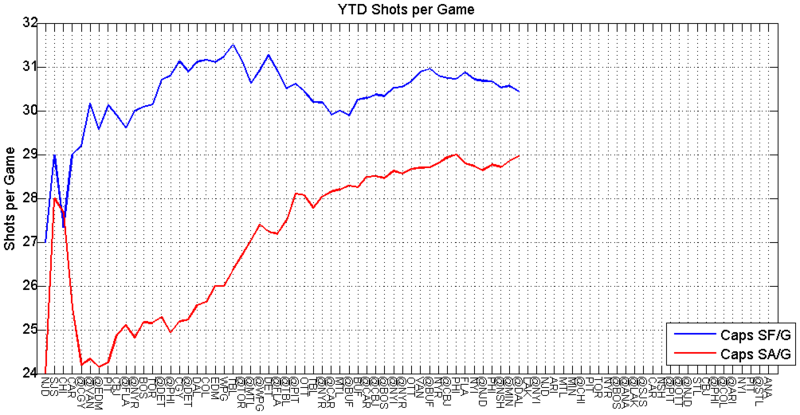 And the corollary to that is obviously that the shots being granted to the opposition are increasing. 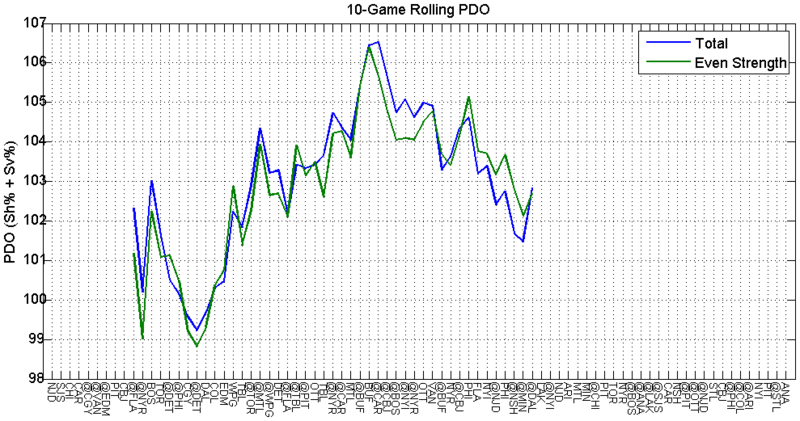 There’s been a steady climb over the last 30 games. Same goes for the penalties taken. Those two increase at about the same time. Which are two independently troubling things. 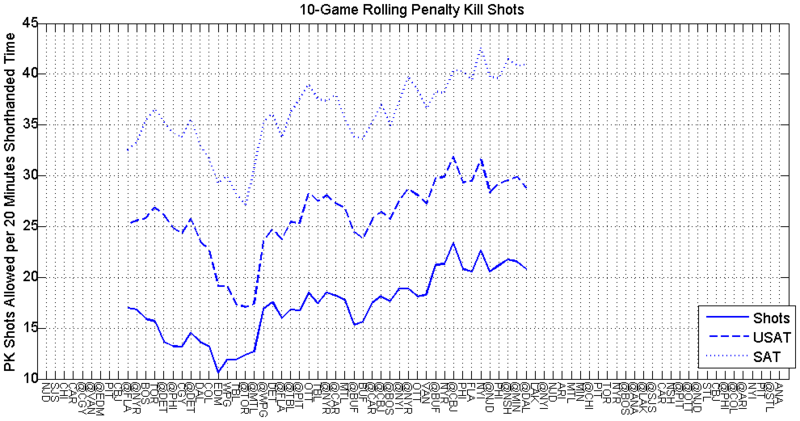 While not as stark as the power play crash, the penalty kill has also not been very sharp over the last 8 games. Still not happy with how the Caps are approaching the game before rubber hits twine. 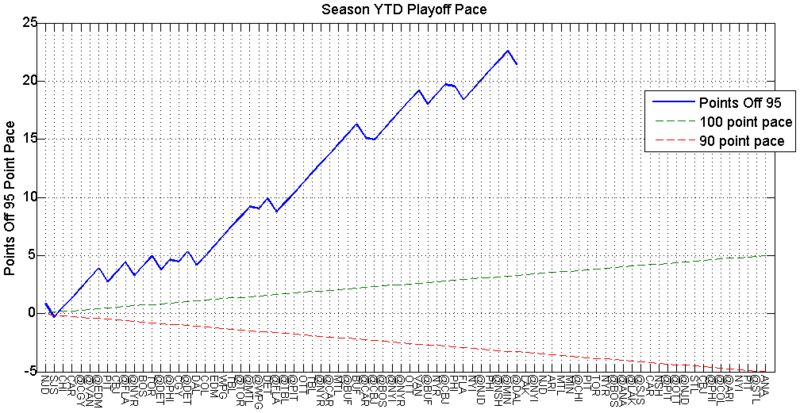 This is likely related to their perceived slow starts. 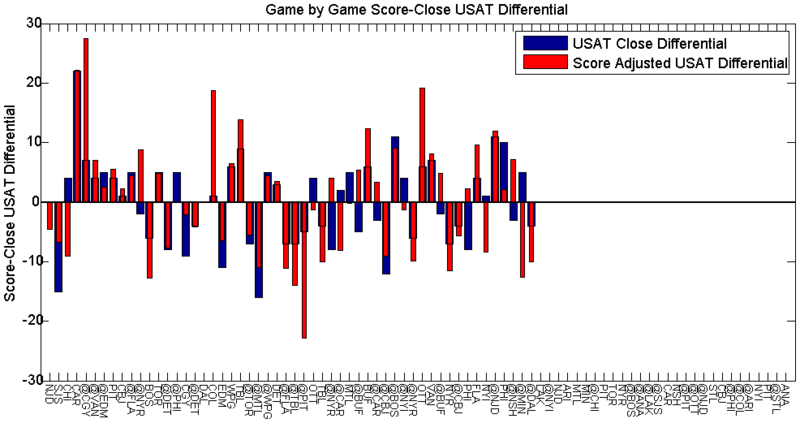 Since the start of the game is the best sample the Caps have at tied score of course. 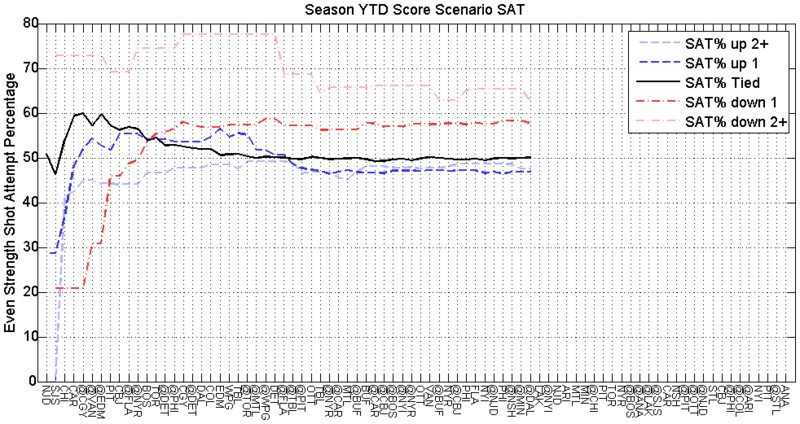 Goodness, they look so steady at 50% SAT when tied. It’s not a terrible figure. I mean with Holtby in net (and performing more like the early season Vezina favorite), and the top two lines they ice, it’s not inconceivable for them to consistently outperform their possession. So at 50% SAT, they’ll still likely (I hope) outscore their opponents. Having said that, there’s no reason they should trust that they’ll outscore their opponent at 50% SAT, and no reason not to attempt to tip the scales further in their favor. We all know how deadly this team is when it scores first. So anything to foster that outcome should be pursued. So are the Caps still a good team? Absolutely. I don’t think they’re as good as their record indicates, but I can’t even begin to imagine what a team that is truly as good as 40-10-4 would look like. They certainly have some areas upon which to improve. 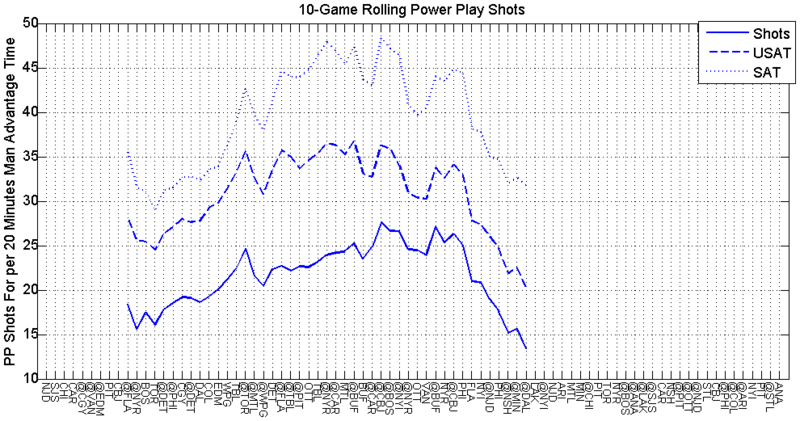 The too many men on the ice trend is problematic, as is that entire being penalized thing. Their slow starts seem to very much be a thing. And righting the special teams ship would be welcome. But those areas shouldn’t stop anyone from enjoying what can only be described as an historic season. So I wanted to move away from my old blog (Laich the Lamp) for a couple reasons. One was because I wanted to not have links to the garbage I wrote last year, in an attempt to make the content available more appealing and semiprofessional. The other reason being that the name really started to bother me. So I started this blog to focus more on just the plots I’ve been generating. And to hopefully have a name that has some staying power; I don’t want to turn into Andy Dwyer from Parks and Recreation (Mouse Rat forever!). So the posts won’t be at published at any particular pattern, if you like what you see, check back occasionally and maybe there will be new content. I have trouble finding the time to provide commentary and actually saying worthwhile things in a post. If people don’t care what I have to say, I can just make posts where I publish only the plots and shut my trap. We’ll see where this goes, but for now posts may be kind of sporadic. They may require a 5 game losing streak to prompt me. 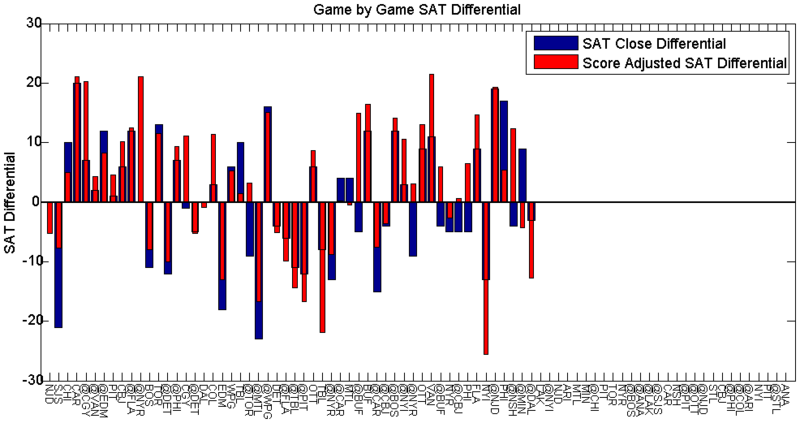 I started making these plots because, unfortunately I don’t get to watch every game. I wanted to be able to see what kind of trends the Caps were creating throughout the season. I also don’t like Excel plots. I don’t know why, could be because of the limitations, or because I’m a MATLAB elitist. Additionally, I’ve never played hockey and only started watching diligently within the past few years. So I don’t usually have anything meaningful to add on what a player is supposed to do or how difficult a certain task is. Nor do I have a vast knowledge of the players of the past. 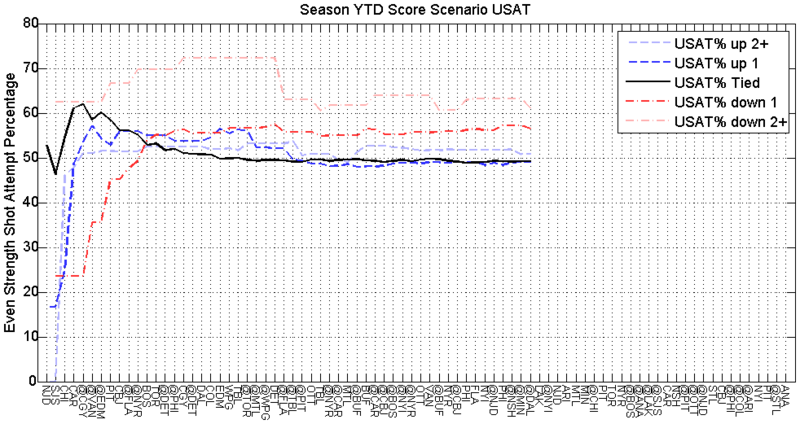 About the plots – they are auto generated using some custom MATLAB code I wrote. I started last year by manually inputting data from a number of sites – mainly ExtraSkater. But when that got shut down I had to write something that could import and reduce the data automatically from what NHL releases. So this is young code, and it has not been peer reviewed. If there’s anyone out there proficient in MATLAB and who knows the formulas used to define some of the advanced statistics, I’d gladly welcome your time to look over the stuff so that I’m not publishing incorrect garbage. Well that about sums it up, I hope you enjoy the content. Feel free to comment or provide feedback.